Former South African President Jacob Zuma sounds like he’s having quite a week. 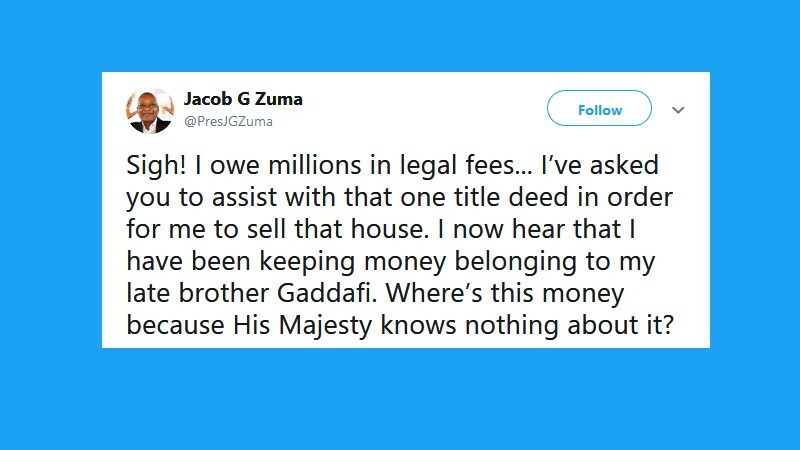 A recent Sunday Times report (paywall) revealed that he was allegedly hiding some R400-million sent to him by late Libyan dictator Muammar Gaddafi at his compound in Nkandla. The report also suggests that the cash was transported from South Africa to Eswatini (Swaziland) earlier this year, while King Mswati III also reportedly confirmed the loot’s existence to President Cyril Ramaphosa earlier this month at a meeting at OR Tambo International Airport. But, with the bills are still seemingly nowhere to be found, Zuma has broken his silence on Twitter with a “sigh”. “Sigh! I owe millions in legal fees… I’ve asked you to assist with that one title deed in order for me to sell that house. 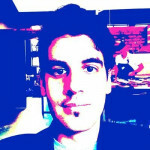 I now hear that I have been keeping money belonging to my late brother Gaddafi. Where’s this money because His Majesty knows nothing about it?” he tweeted. The tweet, published on Tuesday afternoon, has accrued some 1100 retweet and 1700 likes since it was published. Despite the reports, some on Twitter stood by Zuma’s side. They are not selling without your name. They will fool stupids not us. We know u and what u did to us. Under your administration we graduated in numbers and continue to graduate because of your efforts in education. This is still your term. We are grateful to have Papa like u. But it’s not the first time that there have been implications that Zuma’s pocket had been bolstered by Gaddafi. In 2016, Mail & Guardian reported that then US Presidential candidate Hillary Clinton knew about the relationship. Nevertheless, Lindiwe Sisulu, South Africa’s minister of international relations, confirmed that South Africa will investigate the accusations should Libya request it.